One of my New Year’s Resolutions this year was to take more baths. Not a very lofty goal, I know, but that makes it so much easier to accomplish, don’t you think? I try to elevate the experience so it really feels like I’m treating myself to something special. I light a few candles, put on soft music and add bath salts to make the bath smell like a spa. Not only do my bath salts smell amazing, they also provide some great therapeutic benefits as well. 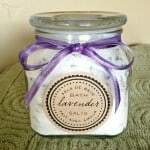 I love Lavender Bath Salts for relaxing after a hard day and Vapor Relief Bath Salts are just the ticket when you’re feeling a bit less than fabulous or need a little boost of energy. Epsom Salt–not the kind of salt you eat but actually a mineral compound called magnesium sulfate which most people are deficient in and can be absorbed through the skin. 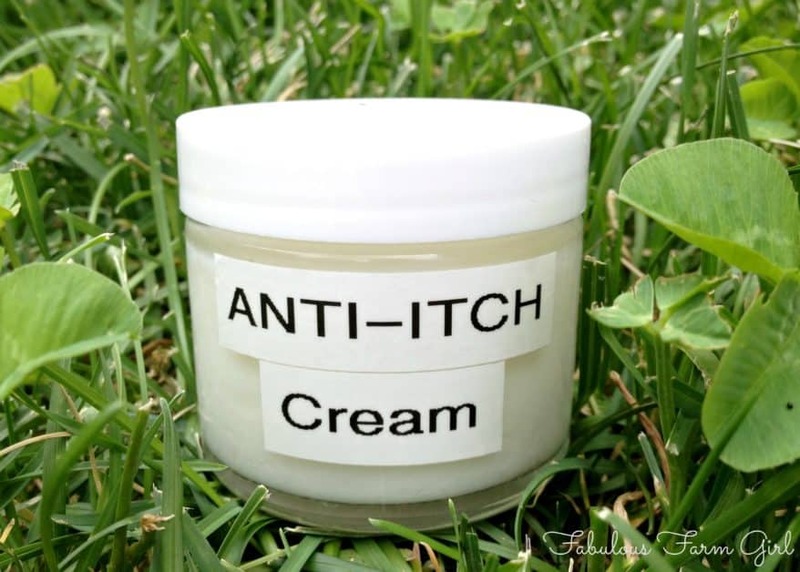 Some of the countless health benefits include relaxing the nervous system, relieving skin problems, soothing back pain and aching limbs, easing muscle strain, treating cuts, soothing congestion, and drawing toxins from the body. Mineral Salt–contains many beneficial minerals and nutrients that keep your skin smooth and soft. Salts also draws out impurities, pollution, oil and dirt from the skin. 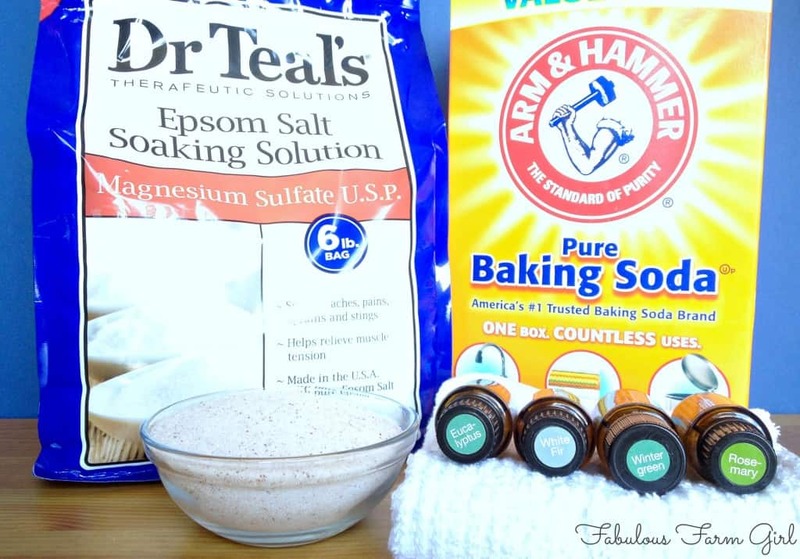 Baking Soda–makes a wonderful spa-like bath for soaking away aches and pains and detoxing. It also cleans the tub and the drain as a bonus! White Fir EO–supports clear breathing and respiratory function, provides soothing support to sore muscles and joints, helps the body relax. Eucalyptus EO–assists with clear breathing, soothes tired, sore muscles, supports healthy immune system function, helps lessen stress. Rosemary EO–reduces sore muscles and joints, helps reduce tension and fatigue, supports healthy digestion. Wintergreen EO–promotes healthy respiratory function, soothes achy muscles and joints. 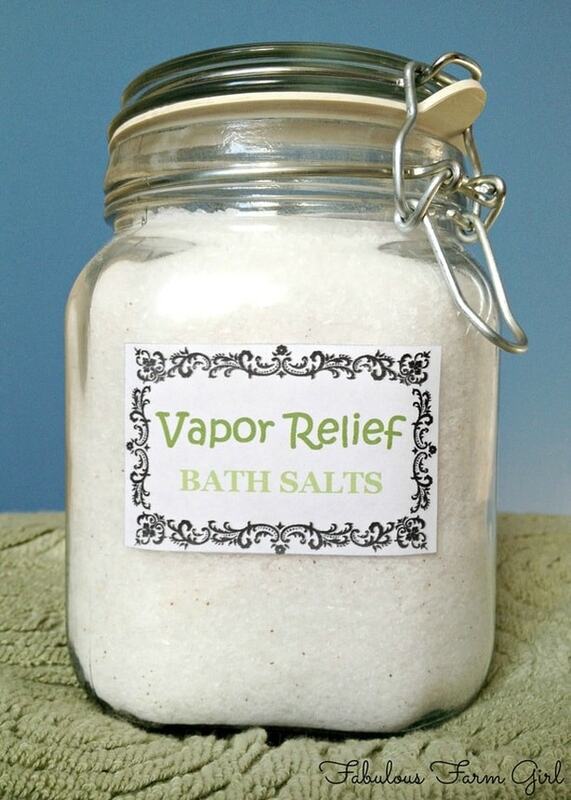 It really only takes a few minutes to mix up a batch of Vapor Relief Bath Salts. Just put all the ingredients in a bowl and mix until well combined and essential oils are evenly distributed. 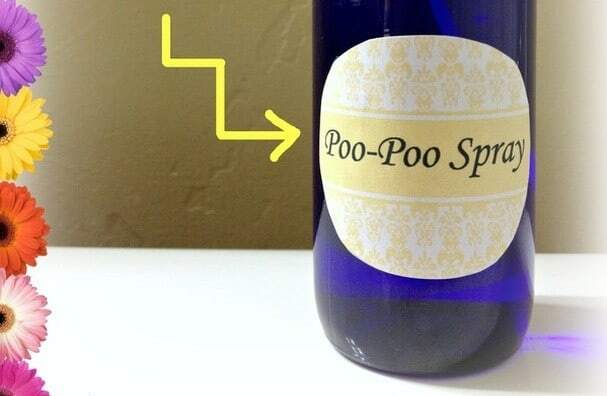 Pour it into an airtight container (I prefer glass) and stick a cute label on it. Although honestly, just opening the lid and smelling it will tell you what it is. And just doing that will make you feel better. I love the smell of these Vapor Relief Bath Salts so much I sometimes use it in the bath even when I’m totally healthy. Of course I could argue that pampering myself once or twice a week with a luxurious smelling bath filled with all these wonderful ingredients is a big step toward keeping myself healthy both mentally and physically. It certainly can’t hurt. I’m thinking this might be the best New Year’s Resolution ever! 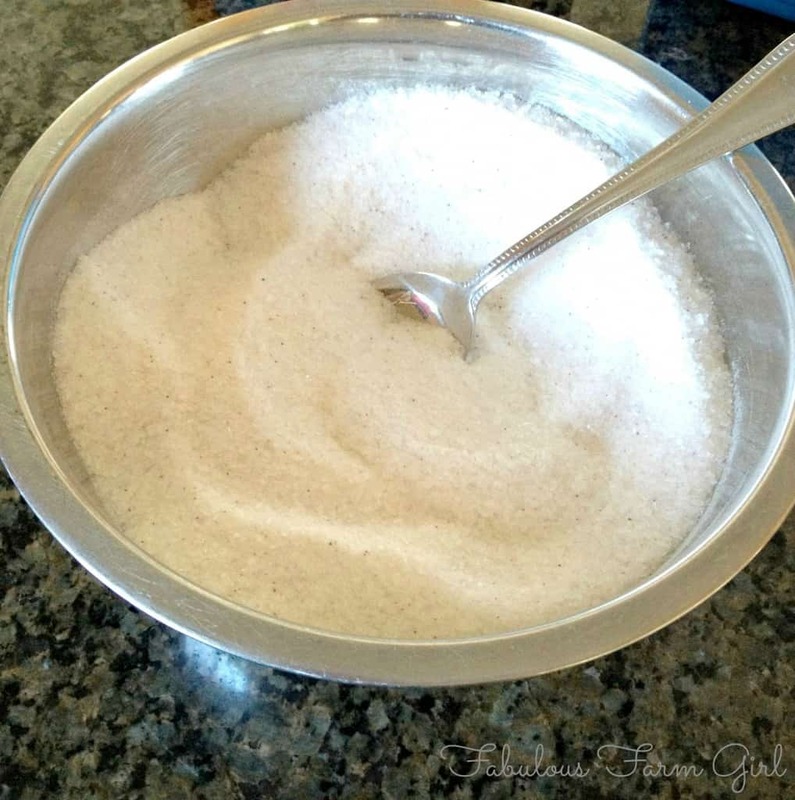 Mix Epsom salt, mineral salt and baking soda in a medium bowl. 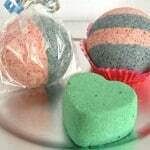 Add essential oils and mix thoroughly to distribute scent. Pour into a decorative air-tight container. Fill tub with hot water and add 1-2 cups bath salts while water is still running. Bathe often and enjoy. Yes Sky, easy is better. Even if you don’t take baths very often bath salts just look so pretty on the side of the tub. And when you do finally take a bath you’ll tell yourself “I really should make a resolution to take baths more often”. Yes…yes you should. Hi Jenn, thanks for stopping by. 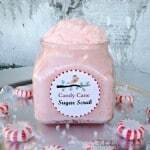 These bath salts are so cheap and easy to make that I keep making new batches using different oil combinations. You could make this recipe using just Thieves oil which would be wonderful when you’re sick or maybe add some eucalyptus to give a little congestion-clearing power. Good Luck! I don’t take nearly enough baths but this makes me want to run in my bathroom, sprinkle in some bath salts and RELAX!! This is great! 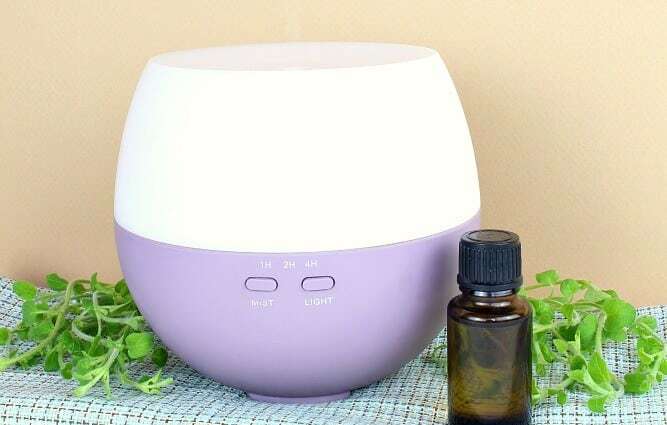 I’m just getting started using essential oils so I appreciate any advice I can get. Can’t wait to try this out! That is great Kara! I love my essential oils and am thrilled you are starting on this wonderful journey. Please come back often to find lots more ideas of ways to use your oils. Same here, Gentle Joy! I love Epsom salts and use them for lots of things but of course, bath salts are my favorite. This one is so great when you are sick and need a little detox. Thanks for stopping by! by the way issential oil and epsom salt and these stuff are soooo expensive in my country 😭 which is United Arab Emerates☺️.